The Colour Handbook - now in softcover - deals with all aspects of urolithiasis in dogs, cats, rabbits and guinea pigs-from aetiology and pathogenesis to diagnosis, treatment and the prevention of disease recurrence. The authors introduce the reader to treatment protocols developed from their own research and experience, and incorporate international state-of-the-art knowledge of the disease. 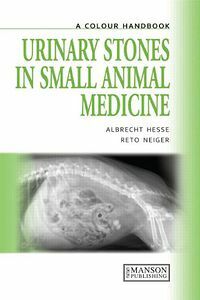 Topics covered in the Colour Handbook include: * Epidemiology * Risks in companion animal husbandry * Species-specific differences * Breed dispositions * Genetic causes * Relevant anatomical points * Clinical diagnosis * Stone composition * Clinical pathology * Treatment protocols The Colour Handbook is a compact, wide ranging illustrated guide to dealing with urinary stones in small animals, of value to veterinarians in training and practice.